I always wanted to make chili from scratch and several years ago I just started throwing things into a crock pot to see what would come out. The first few batches were pretty bland. It was edible, but not good chili at all. So I looked for ways to spice it up, and after many batches I’ve pretty much settled on what I think is a pretty good recipe. If you cook much at all, then you know that in this case the amounts are not terribly critical, so you can adjust as necessary to your own tastes. 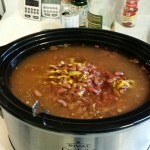 I use a 3.5 quart crock pot to cook the chili. 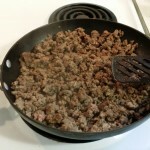 Brown the beef and sausage in a pan, drain, and put it in the crock pot. Add diced tomatoes, Picante sauce, tomato paste, and juice. Using the picante jar, add about 1 to 1 1/2 jars of water. This is for the beans to cook. I usually go by looks here, but it’s always a bit more than one jar. Just enough water to make it soupy, the beans will soak it up. Stir the whole thing well. 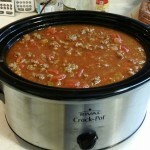 Set the crock pot on high and cook for 6 – 8 hours, stirring occasionally. It usually takes about 6 hours for the beans to fully cook. After it cooks on high, I set the crock pot to low and let it cook for several more hours. After an additional 2-4 hours the chili reaches a really good consistency. 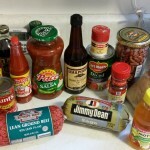 Most of the ingredients for the chili. All the ingredients are in. All the ingredients are in and it’s stirred up.